The computer age is over. 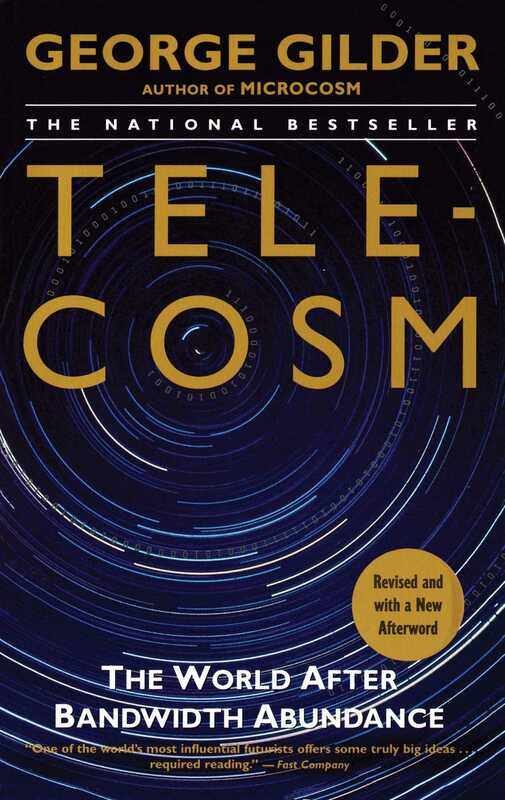 After a cataclysmic global run of thirty years, it has given birth to the age of the telecosm -- the world enabled and defined by new communications technology. Chips and software will continue to make great contributions to our lives, but the action is elsewhere. To seek the key to great wealth and to understand the bewildering ways that high tech is restructuring our lives, look not to chip speed but to communication power, or bandwidth. Bandwidth is exploding, and its abundance is the most important social and economic fact of our time. George Gilder is one of the great technological visionaries, and "the man who put the 's' in 'telecosm'" (Telephony magazine). He is equally famous for understanding and predicting the nuts and bolts of complex technologies, and for putting it all together in a soaring view of why things change, and what it means for our daily lives. His track record of futurist predictions is one of the best, often proving to be right even when initially opposed by mighty corporations and governments. He foresaw the power of fiber and wireless optics, the decline of the telephone regime, and the explosion of handheld computers, among many trends. His list of favored companies outpaced even the soaring Nasdaq in 1999 by more than double. His long-awaited Telecosm is a bible of the new age of communications. Equal parts science story, business history, social analysis, and prediction, it is the one book you need to make sense of the titanic changes underway in our lives. Whether you surf the net constantly or not at all, whether you live on your cell phone or hate it for its invasion of private life, you need this book. It has been less than two decades since the introduction of the IBM personal computer, and yet the enormous changes wrought in our lives by the computer will pale beside the changes of the telecosm. Gilder explains why computers will "empty out," with their components migrating to the net; why hundreds of low-flying satellites will enable hand-held computers and communicators to become ubiquitous; why television will die; why newspapers and magazines will revive; why advertising will become less obnoxious; and why companies will never be able to waste your time again. Along the way you will meet the movers and shakers who have made the telecosm possible. From Charles Townes and Gordon Gould, who invented the laser, to the story of JDS Uniphase, "the Intel of the Telecosm," to the birthing of fiberless optics pioneer TeraBeam, here are the inventors and entrepreneurs who will be hailed as the next Edison or Gates. From hardware to software to chips to storage, here are the technologies that will soon be as basic as the air we breathe.